Get free advice and estimates from hot tub and spa specialists in your city. Many spas and resorts entice potential guests with their list of luxurious amenities, among these saunas and hot tubs. If you could have one of these in your home, which would you choose? The information below will help you decide. Hot tubs are the easier of the two options to install since they are typically placed outdoors with no enclosure necessary. The hot tub will be placed on a level, secure surface that can withstand the weight of the unit and water within. Decking around the tub will house the pump 1 and filter mechanisms. Electrical access will be necessary to power the pump 1, and water access will be needed for filling the tub. This is a job that could be done by a confident DIY homeowner, although a professional is recommended, especially for the electrical and plumbing work. By contrast, installing a sauna means taking up interior space or building a modular enclosure outdoors. The sauna will need to be built from the foundation up using either a prefab kit or other purchased materials. This is a job for a professional since special skills are necessary for the foundation and other steps. An electrician will be required to wire the light, light switch, and the sauna heater controls. If the heater is gas, a plumber will be needed as well. 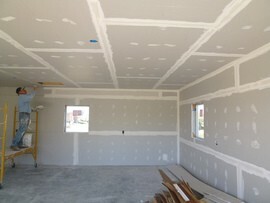 Insulation will go in the walls and ceiling to make the space as energy efficient as possible. Then, cedar paneling will cover the insulation and provide the interior walls and ceiling of the sauna. The heater and rocks will be added, followed by the seats, door, and other finishing details. Installing an indoor hot tub is also an invasive and difficult endeavor. Most likely a new room will be built for the hot tub since the tub will need to be laid before the walls are complete. The best floor surface is a non-slip tile because water will ruin most other floor surfaces. It is also best to install a floor drain in the room. To fill the tub from a convenient source, installing a hose bib in the room will be the best option. Because of the humidity created when the tub is in use, regular drywall 2 should not be used for the walls or ceiling. Alternatives are concrete, glass, cedar, or moisture-resistant drywall 2. An HVAC consultant should install a vent fan sufficient to remove moisture from the room, and the room should be heated to prevent mold and mildew. A sauna that will seat four people, approximately 5 x 7 feet, will cost between $2,400 and $3,200 for the prefab kit with all the materials. Although a DIY homeowner may be able to install the kit, a professional electrician will be necessary for wiring the various electrical elements. 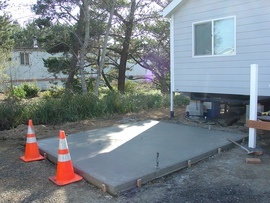 If the kit is being installed outdoors, a foundation slab will need to be installed as well. Labor added to a DIY project will cost about $350 to $700. Labor for the kit to be installed completely by a professional will be approximately $1,500 to $3,000. An entire four-person sauna professionally installed will cost about $3,900 to $6,200. Installing an outdoor hot tub costs more than a sauna. An acrylic tub unit that measures 5 x 6 x 2½ feet will seat three to four people and will cost about $3,500 to $8,000, depending on how many jets and how well constructed it is. The hot tub will be placed on a solid deck or concrete slab 3. Installation, including electrical work and concrete pouring, will cost about $500 if done professionally and about $325 if done by the homeowner. 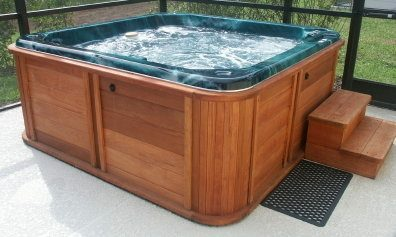 A professionally installed three- to four-person outdoor hot tub will cost about $4,000 to $8,500. Some claim that taking a 20-minute sauna once daily will raise your metabolism the same as a short walk. Soaking in a hot tub for the same time period reportedly has similar results. However, according to livestrong.com, a partner of the Livestrong Foundation, the weight loss effects of a sauna or hot tub are minimal and temporary, mostly due to water loss, which is regained when you hydrate. Also according to livestrong.com, the sauna is an excellent way to cleanse the body of toxins through perspiration. You will not get this same result in a hot tub because you will not sweat as much, especially on your face. Freeing facial skin of impurities is one of the desired results of a good sweat. 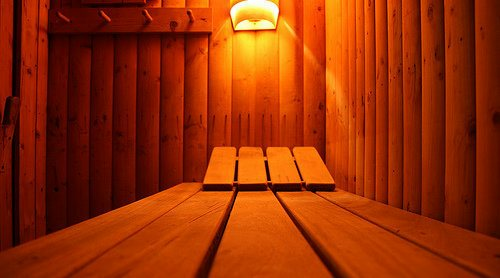 Livestrong mentions other benefits of saunas, such as the cleansing of the skin, increased circulation, and improved function of the immune and lymphatic systems. Another benefit of heat therapy found in saunas and hot tubs is the relief of soreness from exertion or pain from arthritis. Most say that a hot tub is better for these purposes because of the weightless effect of the water and the ability to direct the pressure of water jets where they are most needed. Other benefits from hot tubs are a decrease in blood sugar levels and increased circulation in the case of saunas. Immersing in a hot tub or sitting in a sauna before bed has been shown to increase deep sleep, according to the American Sleep Association. This period of sleep is important for the processing of memories and restoration of brain functions. The effects of heat can be compared to the effects of prolonged exercise on the sleep center of the brain. As with any part of the home, a carefully installed sauna or hot tub will not have any serious maintenance issues like leaks or rotting wood. For day-to-day maintenance, the sauna is more maintenance free. If a sauna’s floor has been properly sealed and wood preservatives applied to the key components, very little maintenance is required beyond regular cleaning. Prop the door open when the sauna is not in use to allow the room to dry and provide towels for the seating areas to prevent perspiration stains. Hot tubs, on the other hand, must be regularly maintained to keep them sanitary and efficient. The water chemistry should be tested and adjusted two or more times a week, depending on how much the tub is used. The spa filter must be cleaned or replaced when the pressure reaches a certain level, which means the pressure must be checked frequently. Even if the spa is kept visibly clean, the water should be drained and replaced every two to four months. Air out the hot tub cover twice weekly to prevent the growth of mold and mildew. New types of insulation, combined with ENERGY STAR® rated pumps 1, blowers, and heaters, and a snug cover, allow your hot tub to operate for about $20 a month in electricity. The best insulating product is full foam insulation, which is injected between the shell and the cabinet of the hot tub unit. The most energy-efficient sauna is the Far Infrared (FIR) sauna. The warm-up time of about 10 minutes is the key. A traditional sauna heater takes 40 to 50 minutes to heat. The type of insulation used for a sauna’s walls and ceiling is important as well. R-11 is the type recommended for interior walls and R-19 for exterior walls. With an energy-efficient sauna, you can expect to spend about $0.26 an hour. Because saunas only run when in use, they cost significantly less to operate than hot tubs. Do not let children under five use a hot tub. Pregnant women should stay out of both saunas and hot tubs since either can be harmful to an unborn child. Alcohol, prescription medications that cause drowsiness, or recreational drugs do not mix well with intense heat. Unconsciousness can result, causing possible drowning in a hot tub or severe burns or dehydration in a sauna. As with any other home feature, it is up to the homeowner to ensure that guests are safe in the sauna or hot tub. All of the above precautions should be shared with guests. As the homeowner, you could be liable for any slip-and-fall, heat exposure, or other injuries sustained while a guest is in your home. In addition, an outdoor sauna or hot tub could be considered an attractive menace, a legal term referring to features of a home that may be inviting to trespassers, particularly children. Check local regulations to see what precautions you must take to protect yourself from liability if someone should be harmed by unauthorized use. A sauna increases the value of a home, and it is seen as a luxury item that is even more valuable in an upscale neighborhood accustomed to such luxuries. Real estate professionals are not as sure about hot tubs, however. The attractiveness of a hot tub has been given an iffy standing by many remodeling professionals. Much like a swimming pool, whether a hot tub increases a home’s value depends on many factors, including the personal preferences of the buyers and the quality of the hot tub. How much does it cost to install a sauna or a hot tub in my city? Cost to install a sauna or a hot tub varies greatly by region (and even by zip code). To get free estimates from local contractors, please indicate yours.